Keep warm in fashionable women's jackets from GearBuyer. 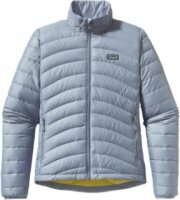 Browser warm and stylish women's jackets from The North Face, Burton, Patagonia, Columbia, Arc'Teryx, Marmot, Mountain Hardwear, Spyder and more. The North Face Metropolis Parka - Why choose whether you want to look good or stay comfortable this winter? 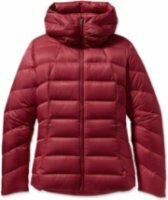 The North Face Women's Metropolis Parka keeps you warm with lightweight, compressible 600-fill down insulation and it keeps you looking good with quilting throughout the body and a removable hood for a look that you can change with your mood. While the Metropolis' timeless styling ensures that you won't have to shop for another casual winter coat next year. 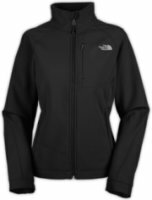 The North Face Osito Jacket - The North Face Osito Jacket for Women Features. The North Face Osito Jacket for Women. 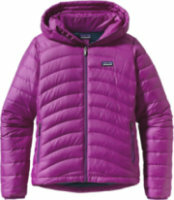 The North Face Osito Jacket for Women is a great way to get ready for winter. 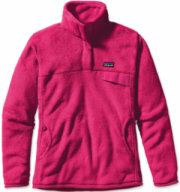 It's made from durable and soft silken fleece that keeps you warm and is gentle at the same time. A brushed collar feels soft against your skin and prevents chafing. It is a perfect option for layering, and is zip-in compatible with other garments. The North Face Aconcagua Jacket - The North Face Aconcagua Jacket's silky fabric and ultra-warm feel make it a favorite every season. This is a down-filled jacket, so you know it will be extremely warm. The design is quilted to provide a low-profile fit, and also to keep the down evenly spread. 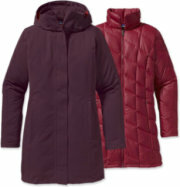 The North Face made the quilting tighter toward the middle to create a flattering, feminine shape. The Aconcagua Jacket can also act as an insulator. The North Face Venture Jacket - When black clouds descend from above the canyon, reach into your backpack for The North Face Women's Venture Jacket. The waterproof, breathable HyVent 2.5-layer membrane and fully taped seams easily shed water and keep you bone-dry while you make your way back to camp. Constructed with 100% recycled nylon ripstop fabric, the Venture gives you eco-friendly vibes while you endure pelting rain or sleet. Underarm vents ditch excess heat, a fully adjustable hood with hidden drawcord system shields your head and face from the elements, and the brushed chin-guard lining offers comfort when you zip all the way up. The North Face Transit Jacket - If you've ever been caught outdoors when the temperatures start to plummet, then you know that it's no fun being caught outdoors when the temperatures start to plummet. The North Face Women's Transit Jacket is a 600-fill insulating mid-layer that will take the discomfort out of that uncomfortable situation. The goose down traps heat close to your body and the DWR finish will shed some rain to ensure that you're toasty warm. Patagonia Re-Tool Snap-T - The Re-tool Snap-T Pullover is bound to be your newest cold weather go-to. It's lightweight, compressible deep-pile fleece (51% recycled) and extra-long fibers for warmth retention without bulk make it a great jacket to wear with a t-shirt or a few other layers. The Re-Tool Snap-T is super-soft and even has side-entry kangaroo pockets and an envelope-style chest pocket. You will for sure feel self-assured while wearing this, even if you run into your ex while on a ski vacation at an all-inclusive resort. The North Face Apex Bionic Jacket - The North Face Apex Bionic Jacket for Women Features. The North Face Apex Bionic Jacket for Women. The North Face Apex Bionic Jacket for Women is a versatile and widely worn soft shell jacket with enhanced windproof features and a stretchy, comfortable fit ideal for weekend and weekday activities. This superior soft shell is the ultimate all-around coat for windy, rainy weather Constructed with the most protective Apex fabric, TNF Apex ClimateBlock, this material is both wind and water-resistant and maintains a comfortable level of breathability, that's why it makes perfect sense why this is one of North Face's most popular items. The North Face Thunder Jacket - Reach for The North Face Women`s Thunder Micro Down Jacket when you need an extra layer of warmth to combat the frigid winter air. Its 800-fill down insulation keeps your core toasty, while the Thunder`s compressible design allows it to stow easily in its own hand pocket when you ski tour or snowshoe. Natural down is the warmest, lightest, and most compressible insulation available, but when it gets wet it clumps, stops insulating, and takes a long time to dry. The North Face Arctic Down Parka - When just walking a few blocks to the coffee shop feels like an Arctic expedition, slide on The North Face Women's Arctic Down Parka to warm your bones. 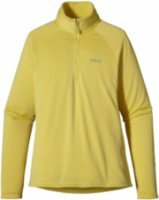 Its HyVent 2L fabric is waterproof and breathable so you stay dry and comfortable while you stroll through snowy storms, and the 550-fill down insulation boosts your body warmth even on frigid January and February days. The Arctic Down has a regular fit with a knee-length trench cut to warm your knees all the way up to its insulated hood. 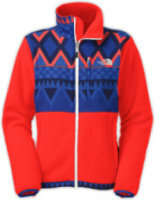 The North Face Oso Hoodie - The North Face Oso Jacket is ridiculously soft and comfortable. This full zip jacket is made with silken fleece; a luxuriously cozy fleece. Abrasion-resistant taffeta panels cover the shoulders aiding in this hoodie's durability. Two sleek hand pockets provide space to place your hands and stash some items. This new and improved design by North Face is a traditional style that offers superior comfort and durability. With a super soft, high loft hood, it is sure to be a favorite this season. 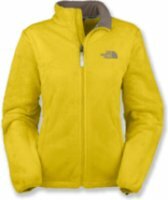 The North Face Denali Jacket - The North Face Women's Denali Jacket is our most popular North Face jacket, and with good reason. The Denali jacket features super soft and durable recycled Polartec 300 series fleece constructed with DWR, a bluesign approved fabric, and zip-in compatibility with select North Face outerwear. The abrasion-reinforced shoulders and elbows will add superior protection during those wicked snowball fights with the boys. The women's Denali has a standard fit, weighs just over 20 ounces, and is designed to layer over your favorite North Face clothing while still showing off your hotness. 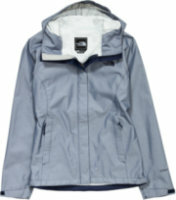 Marmot PreCip Jacket - "The women's Marmot Precip is a grade-a rain jacket if there ever was one. The hood is big enough so that you can really pull it down and keep the rain out of your eyes. The pit zips come in handy for ventilation more than you think they will, too. I'm no badass, so I wear mine more as a casual rain jacket, and not only does it keep me supremely dry, it's also pretty cute. The North Face Boundary Triclimate Jacket - The North Face Women’s Boundary Triclimate provides an amazingly warm winter jacket experience. This 3-in-1 North Face jacket is great for adjusting to changing weather conditions. The fleece liner can be zipped out and worn alone or you can wear the hard shell by itself to protect against wind or rain. Then zip the two together for a North Face jacket that is sure to keep you warm in any weather. Mountain Hardwear Downtown Coat II - Down is just as functional on the city streets as it is in the mountains, and wherever you find yourself, you want to be warm. The crew at Mountain Hardwear designed the Women’s Downtown II Down Coat to give you city-wise style with big-mountain warmth. Longer than some but shorter than a floor-length ballgown, this down coat goes downtown to midtown and then to uptown, keeping you warm from your head to your knees. The North Face Kira Triclimate Jacket - The North Face Women's Kira Triclimate is a fully featured jacket for hitting the slopes, hitting the trails or hitting the town. Its 3-in-1 functionality allows it to be your go-to jacket in at 3 seasons. 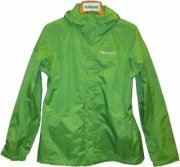 The outer shell is constructed from HyVent 2L (waterproof and breathable) and is more than capable of handling stormy fall/spring weather. The interior mid-layer features Heatseeker insulation and can tackle excursions in the fall or strolling around the city.